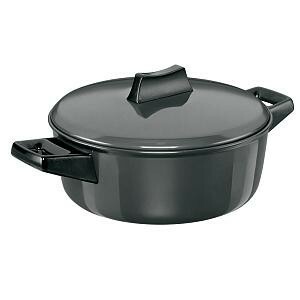 Futura Hard Anodised Cook-n-Serve Bowls are ideal for cooking a wide range of Indian and Werstern dishes. The 4 mm thick base and sides of these Cook-n-Serve Bowls spread heat evenly and retain warmth for a long time - making them excellent utensils for both cooking and serving. Cooking and Serving in the same bowl makes good sense - the food stays hot longer and you have less to clean up and less for storage. These bowls are designed for convenient cooking and elegance on the dinning table. The Hard Anodised finish on these bowls will stay looking new for years. Each bowl comes with an instruction manual with 12 tested recipes.